We still have a long ways to go until Victoria’s Secret’s Black Friday 2019 sale arrives. But you can scroll down the page to check out the details from their last Black Friday sale to get an idea of what’s likely to come. Enjoy! Updated on Wednesday November 14, 2018: Victoria’s Secret Black Friday ad has just leaked! We’ve posted all 5 pages below — Enjoy! Free tote bag: As we’ve come to expect, Victoria’s Secret’s free Black Friday tote bag deal is back again this year. We’re not yet sure what the minimum purchase amount is to get it but last year it was yours free with any $75.00+ purchase (while supplies lasted). Angel cardholders will be the first to be able to get the tote offer as well as shop the Black Friday deals. The deals: VS is calling their sale this year the “Most Epic Black Friday Ever.” You’ll find 40% off PJ tops and bottoms, bras on sale for up to 50% off (priced as low as $35), PINK hoodies also on sale for as low as $35, BOGO free sleep separates, and PJ sets on sale for as low as $39.50 (many include free slippers). Store hours: Most stores will be open in the late afternoon on Thursday, Thanksgiving day. However you will need to contact your local store for their store hours as they will vary by location. If you can’t wait until Black Friday, then here are all of Victoria’s Secret’s current Thanksgiving weekend deals which just went live today! What new lingerie or cosmetics are you planning on getting at Victoria’s Secret Black Friday sale this year? Let us know in the comments section (you’ll find the comments at the very bottom of this page). Updated on Thursday, November 23, 2017 (6AM PT): Victoria’s Secret officially announced their 2017 Black Friday ad — we scanned it in for you in full, including the mile-long terms and conditions. Check it out below! Of course their wildly popular free tote-bag offer is back again this year. You’ll be able to get it when you spend $75 or more on your online or in-store purchase (a $68 value!). The deal officially begins at 5:00PM ET online this afternoon and in stores when they open their doors tonight (hours vary by location this year). Use promo code FRIDAYPAIR to get it. Just be quick because they tend to sell out fast! In terms of store hours, most retail locations open today, Thanksgiving day, at 6:00PM and are staying open through midnight. Just keep in mind that some stores may be closed or open at a later time so check on Victoria’s Secret site for hours in your area. Updated November 23, 2016: Just moments ago, Victoria’s Secret officially announced their Black Friday deals for 2016! The sale starts online at 5:00PM EST/ 2:00PM PST. In stores, most retail locations are opening their doors at 6:00PM Thursday afternoon, Thanksgiving day. However this may vary store to store so be sure to check before you leave the house. In terms of the deals, you guessed it! It’s a tote bag again this year, with free mini tote in there too. It’s free while supplies last on orders of $75.00 or more. You’ll just have to enter promo code 75TOTE to get it. All clearance items are excluded from counting towards the minimum purchase threshold. 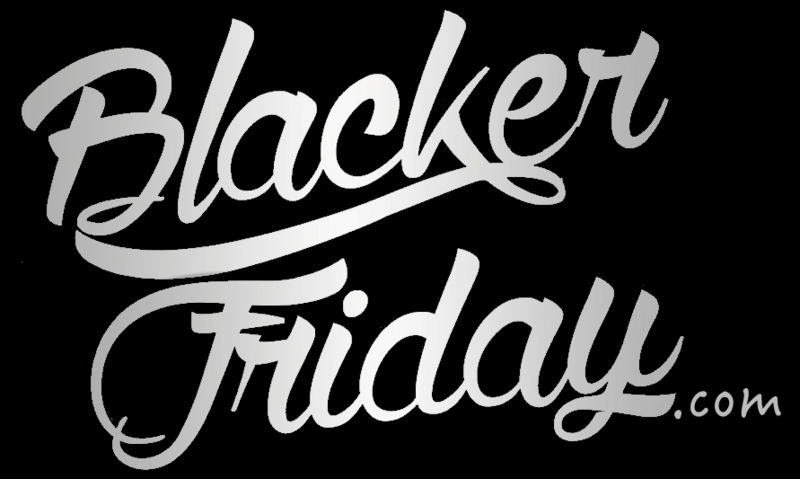 Other featured Black Friday deals this year include 50% off select sport bras and bralettes, BOGO free on beauty gift sets and accessories, free slippers with the purchase of a pajama, and all rollerballs for just $5.00 (normally $18.00). There will also be some great deals on PINK items as well. Free shipping is included anywhere in the continental U.S. on orders of $100.00 or more. We’ve posted the full flyer down below with all the highlights and official terms so check it out! We finally got the Black Friday deals at Victoria’s Secret (they are now live online!). Prepare for an awesome sale again this year – Ready?! Starting today, Friday November 27, 2015, you will get $20 off your purchase of $125 or more plus free shipping as free shipping is offered on all $50 or more orders! Just remember that this as an online offer only and all you need to do is to apply promo code 20OFF125 at checkout to get $20 off and promo code SHIP50FREE for free shipping. Unfortunately this offer excludes the clearance items (prices ending with $.99) and non-Victoria’s Secret brands. These offers are valid until December 2, 2015, 11:59 pm PST (including Cyber Monday of course)! Also, with any purchase of $75 you will receive FREE limited edition tote again this year with promo code FRIDAY. But hurry up as this offer ends on tonight, Friday November 27, 2015 at 11:59 pm PST or while the “totes” last! If you decide to shop in your local Victoria’s Secret store check the opening hours as some stores open already on Thanksgiving Day at 6:00PM local time. The tote is totally worth receiving as it’s a 22″ L x 7.5″ W x 16″ H bag, 100% cotton canvas with sequin front panel and contains must-have beauty items. There are few more great deals among which these are my favorites: buy one get one 50% off bras, $30 PINK gym pants, up to 60% off sweaters and $25 eau de parfum! All of these offers last till December 2, 2015 or while supplies last so let’s start shopping and spoiling ourselves! For your reference, we’ve included Victoria’s Secret’s entire BF ad scan and the mile-long terms and conditions below. 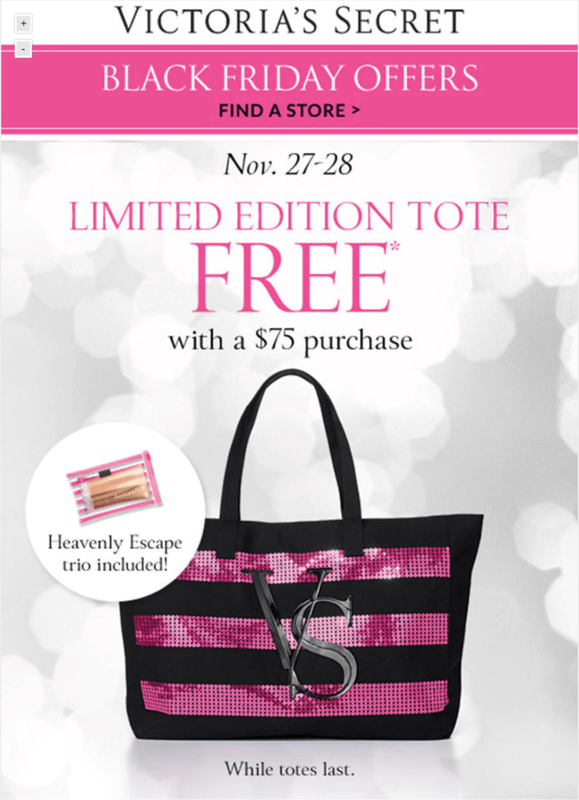 Victoria’s Secret has jus released their Black Friday deals and along with the deals, you’ll get a free limited edition tote bag with their Heavenly Escape Trio inside for all orders made above $75.00. Sale runs from November 27th to 28th only and while supplies last. There is also a limit of one free bag per customer so just keep that in mind. In terms of the discounts, you’ll buy one get one half-off on select bras, get free slippers with purchase of select pajamas, and pick up VS perfume for as low as $25.00. You’ll also be able to get a sport fleece hoodie for just $39.00 and Ultimate or Varsity Crew leggings for $25.00.